Châlon-sur-Saône won the first Coupe de France trophy for the newly established U17 age group - as until 2012 this competition had been played by the U18 category. 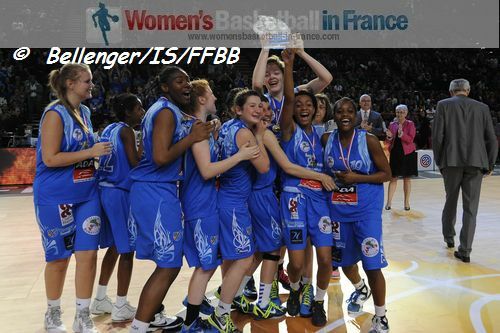 They defeated Angers UFAB (64-55) in a match that was only decided during the last two minutes. As usual the women's final opened the last day at Paris Bercy with a match at 9:15 in the morning. However for the first time it was possible to follow a live stream of the match. Angers UFAB came into the final as the favourites because they had eliminated USO Mondeville in the semi-final of the competition. However over the years the youth finals in the Coupe de France have not always gone the way of the favourites. Châlon-sur-Saône found their range quickly and led (10-4) after five minutes. While Jenny Laidlow made her present felt for Châlon, Méline Serot was doing likewise for Angers as her side reduced their deficit to 2 points (10-12) with eight minutes played. Both teams struggled for the rest of the game with their shooting and the free throwing was also terrible. Châlon led at the end of the first quarter (14-10) and traded basket for basket with their opponents for most of the second quarter to lead (30-26) at the break. The third quarter was more scrappy than beautiful as both sides struggled to get accustomed to the hall. Angers were able to turn things around with 7 consecutive points by Audrey Chevrier to take the advantage going into the final quarter (48-44). Châlon stepped on the gas at the start of the final quarter and were soon back in the driving seat with a three-ball by Laura Varandas and offensive rebounding by Sarah Dutoit. During the last six minutes the game finally opened up with both teams taking risks and shots finally falling. 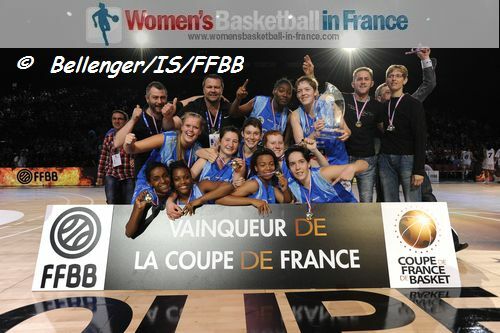 The pendulum stayed in favour of Châlon-sur-Saône who went on to win by a comfortable margin (64-55) and to take home their first "Coupe de France" trophy.